Well, hello there Monday! You snuck up on me! This is probably due to me working on all day on Saturday, but that's ok, I'm in a great mood and starting the week off on the right foot! Last week was a crazy one. I managed the desk at the gym for the second half of the week along with my usual personal training schedule...that makes from some craziness. I don't mind the craziness sometimes though. A good week of shaking things up can be fun and I got to see my gym peeps that I hadn't seen in forever since I'm normally just there for training now. It was great catching up with them! Tony and Jay took to making dinner together! 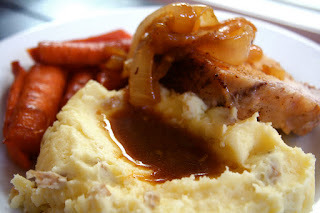 Oven roasted pork with carrots, onions and mashed potatoes was the feast that hit the menu! We are teaching Jay how to really cook these days. Sure, he's only 14 (I started cooking way before this by myself), but we figure now is a good time to help him learn his way around the kitchen. Besides, seriously, what woman doesn't like a man to cook with her? I always love being in the kitchen with Tony! Anyway, we are putting together a family cookbook with Jay. That way, when he does leave home (years from now), he has his own cookbook to take with him. Tony's mom did something like this for him and we still have the notecards with the recipes in our recipe booklet. They are great reference and great memories for us of things Tony cooked for me when we first met! This is Jay's and Tony's recipe, obviously it's a good thing we shop at Costco...2 sticks of butter in this meal and 4 lbs of potatoes for the mashed potatoes! Don't worry, there were a lot of leftovers. Also, that temp is 160 degrees on the pork, not 100...just in case you needed clarification. I can't get enough of this flatbread! I make it at least 5 days a week! 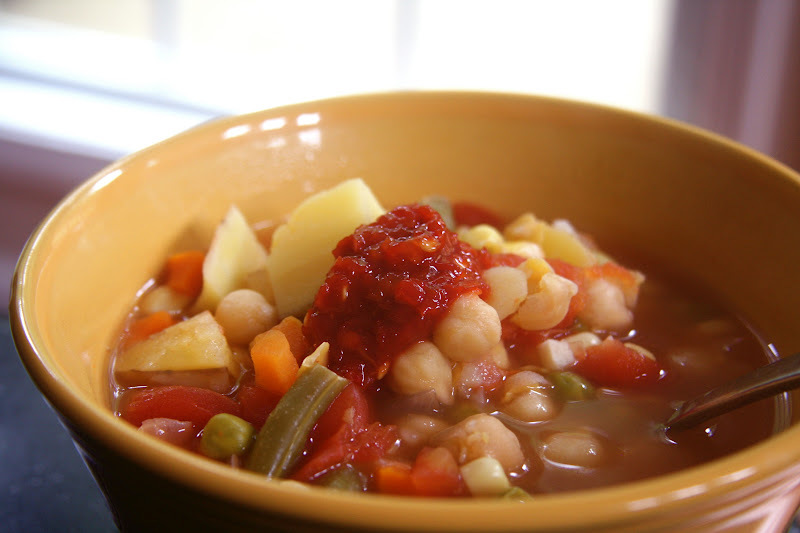 We make sandwiches with it and I can't get enough of it with my soups..
We made a batch of Tony's vegetable soup topped Chinese chili sauce! Let's just say I'm guarding myself from this cold. I'm also still loving the last of my summer salads this week! 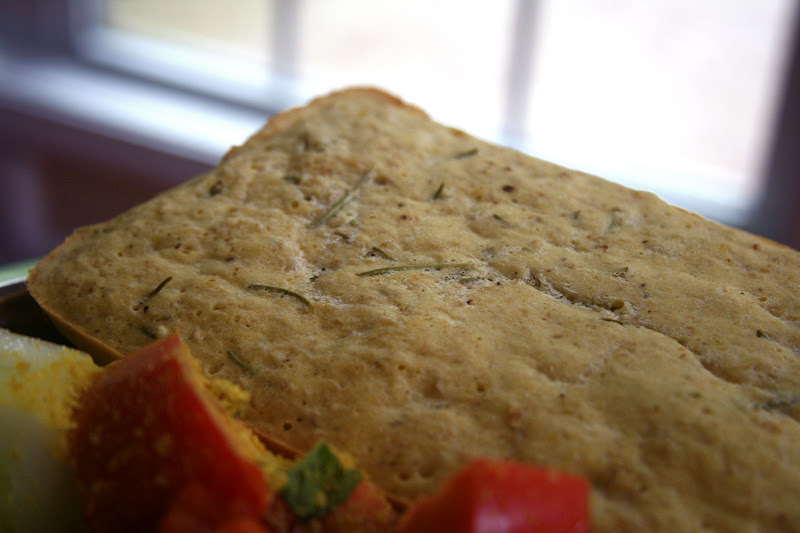 My latest obsession with the chickpea oat flatbread is adding fresh rosemary. YUM! I wish I could say that was my idea, but really it was Max that suggested it. The boys is pure genius I tell you! 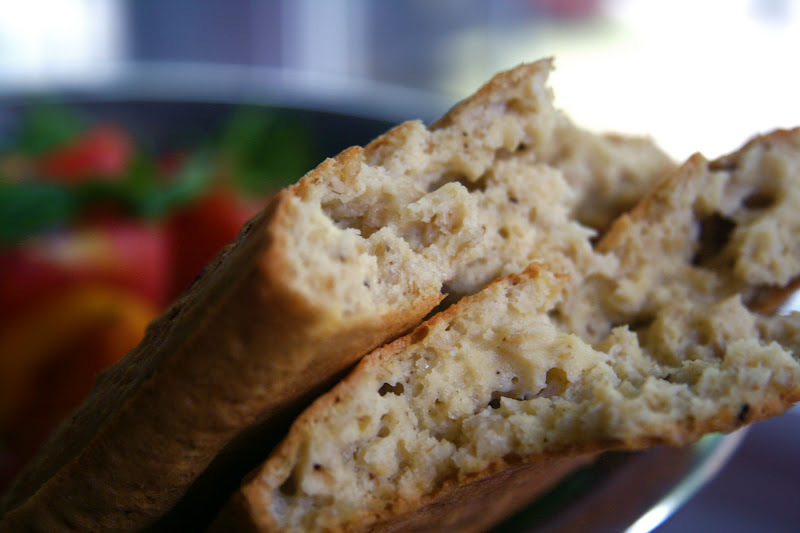 The loaves are so easy to throw together, bake quickly and are loaded with protein and fiber! I can't get over how doughy they are on the inside and crispy they get on the outside. Preheat the oven to 425 degrees. Spray a 9x5 bread pan with olive oil. Combine the dry ingredients and then add the wet. Stir to combine. Pour the batter into prepared pan and bake for 20 to 25 minutes. How about you, are you ready for the week? Do you like crazy weeks sometimes? I really do (making a little extra money doesn't hurt that either), I think it helps me really see that things are as crazy as they seem during my regular weeks. How old did you start cooking? Do you remember what you first made on your own? Mine was muffins! I remember the day like it was yesterday. I'm sharing this on Slightly Indulgent Tuesday and Allergy Free Wednesday. I would LOVE to try this recipe out. What are the dimensions of your bread pan? The pan is 9x5. I updated the recipe too! Monday always seems to sneak up on me! I love that you're teaching your son to cook AND that he wants to try too. That's really cool. I need to try out that flatbread. It looks awesome. Do you think chia eggs would work with it? Oh and what about regular oats vs quick cooking? I do think chia egg would work. I've used flax egg before too. I would cut back on the water just a bit though if using chia egg. If you use regular oats, grind them in the food processor to make oat flour. I do that too. I will change that on the recipe. I love how passionate you are about this bread!! So cute. I didn't start cooking until I met Jay. Now I LOVE it!! My co-worker and i were just commenting that this weekend didn't seem like much of a weekend. How nice that your men were there to help with the cooking! Love this flat bread - I'm a huge rosemary fan. Is 9x5 the standard size bread pan? i just ran out of chickpea flour. I wonder if coconut flour would work. Hope you get a day off soon, i feel ya! That is such a cool idea and so great that you are getting Jay cooking. 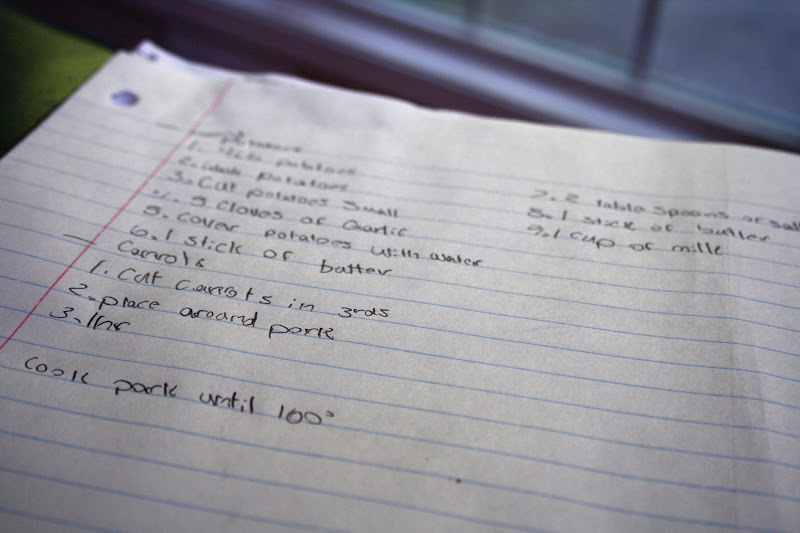 It is shocking how many kids leave home without knowing how to cook (and I was one of them!). that is so awesome you are teaching Jay to cook - that will be great for him later on, not to mention impressive :) I love the cookbook idea too. yum looks great. love easy flatbread recipes ;) and we adore rosemary, we used to grow it ourselves miss it. need to grow it again! Ooooo, this sounds like something even I can handle! haha Sounds great, especially with rosemary. any idea for a substitute for oat flour? I'm totally drooling over that flatbread!!! LOVE and making ASAP. Thanks for a great recipe. I have a lot of sensitivities unfortunately and two of them are egg whites and anything fermented like vinegar. Do you have any substitute options for the egg whites and the vinegar? Lynn, flax egg does work and you can just go without the vinegar. 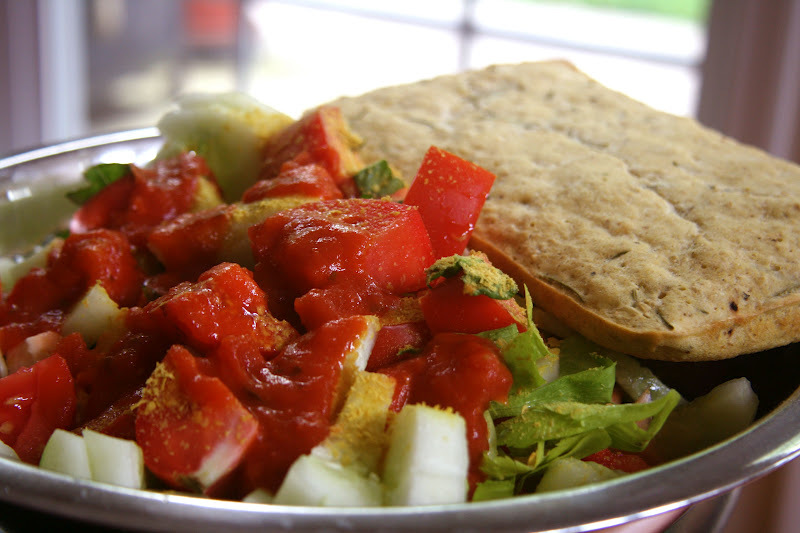 I like the vinegar because it seems to give the bread a little more lift, but it is definitely not required. I hope you enjoy it! this looks incredible! just saw heather link it up and you outdid yourself on this one, Sarena! I FINALLY got around to making this flatbread. I've been obsessing over it since you posted. I made it along with some Indian inspired dishes. 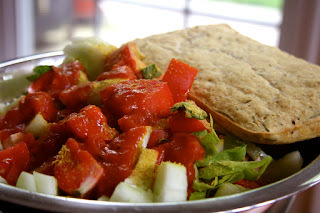 I cannot thank you enough for posting your recipe for this AMAZING Flatbread! Seriously, I was so shocked and excited to find a bread recipe (for my daughter) that did not call for any of the "gum ingredients"! She is 12 and was just finally diagnosed earlier this year (after years of being sick) with multiple food allergies (Wheat, Gluten, Dairy, Eggs, Soy, Peanut and ALL of the gums - Xanthan, etc.) She has not had any bread since... February. It has been a dream of mine to find her a bread so she can have something she likes and something that is "normal looking" in her lunch bag at school. GOD BLESS you for sharing what you know! I want you to know that my eyes filled with tears when I tasted the flatbread! Then I danced around in my kitchen as I thought of the many ways I can use this bread: as a sweet bread (swap savory ingred. for cinn. and sugar), as a tortilla (I'll try pouring onto skillet), or use it as a PIZZA CRUST! Oh my, Pizza!!!!! Another item we have not had in a very long time due to the gum allergies. Thank you so much! I am praying for you to be blessed! ...also, FYI: I used the Powdered Egg Replacer recipe from wholenewmom.com in your recipe and it turned out great! have you ever tried a stovetop or skillet version? Making this delicious bread again tonight!! It's a family favorite and always perfect with soup.